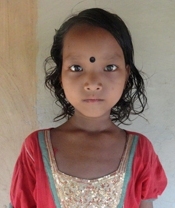 Puspo Patro is a seven years old young girl from Patro indigenous community of Paikpara village under Sylhet district. Now she is a student of class two. Her father Khitish Patro was died when she was only five. She has three brothers and a sister, all of them are also school going students. Her mother Ms. Ratna Patro has no any land property or any other resources. For that reason now they are about to stop their education due to financial crisis. But Puspo Patro does not want to leave her school. She has a dream to be a doctor in future. So, she is seeking support from any individuals or from any organizations to continue her education.